Southampton emerged victorious from a lifeless clash at relegated Middlesbrough, where disillusioned fans made their anger clear as the Riverside bid a meek farewell to Premier League football. Boro's return to the Championship was confirmed by Monday's defeat at champions Chelsea and their final top-flight home match brought precious little relief. Under-fire Claude Puel's much-changed Southampton side secured a 2-1 win on Teesside, where the home faithful resorted to gallows humour to underline their anger at their side's latest underwhelming display. Boro's much-loved chairman Steve Gibson faces a big decision on whether to retain Steve Agnew as head coach after failing to spark a late-season revival following the March departure of Aitor Karanka. The Spaniard's name was chanted by Boro fans after Southampton substitute Nathan Redmond scored a goal just as impressive as Jay Rodriguez's first-half effort. The visitors' second led things to unravel off the field, with goalkeeping coach Leo Percovich gesticulating wildly in the technical area before Boro fans urged Anthony Taylor to send off their own goalkeeper Brad Guzan after giving away a penalty. That plea was ignored and instead the home faithful cheered wildly as Shane Long blazed over the spot-kick - celebrations matched when Patrick Bamford scored his first goal in 760 days. It was a consolation goal in a match that underlined the issues faced at the Riverside Stadium. The first half was without rhythm, excitement or clear-cut opportunities - little surprise given how little this match meant to either side. It took 23 minutes for Ryan Bertrand to get away the first noteworthy shot. In keeping with the start, it was poor. Fraser Forster comfortably dealt with a long-range effort from Boro forward Bamford shortly afterwards, before George Friend headed wide. That was the hosts' best chance of a drab first half in which Maya Yoshida's tame header brought ironic cheers from the hardy away support. There was precious little else to take joy from until the 42nd minute when, out of nowhere, Saints clicked in style. Long chased Jordy Clasie's ball down the right flank and sent in a cross that Rodriguez met with a superb volleyed effort. It was the only moment of quality in a half that ended with boos echoing around the Riverside. Adam Forshaw saw a shot deflected wide and Bamford mishit when play resumed, but things would soon get worse for the hosts. Shambolic defending meant Redmond was unmarked, with the substitute cutting inside before unleashing a fine strike into the top corner. 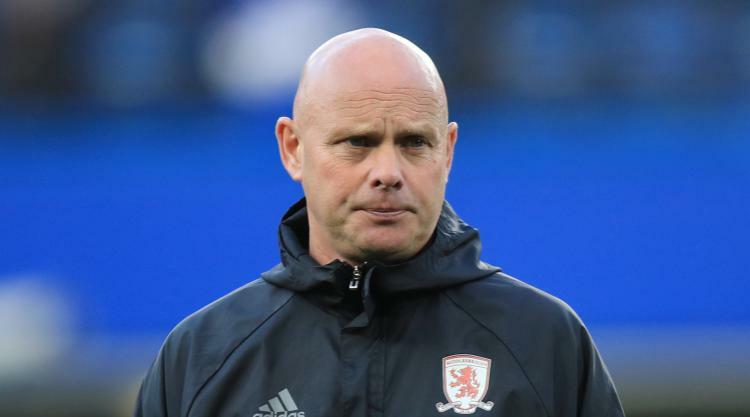 More boos echoed around the Riverside as pockets of fans began to chant former manager Karanka's name, with goalkeeping coach Percovich geeing up the fans and appearing to gesture he wants to stay at the club with Agnew. Things were unravelling and could have got worse when Guzan brought down Long, with some Boro supporters urging referee Taylor to send off the American. The request was ignored and Long fired over the resulting spot-kick. A strange afternoon continued as Bamford headed home his first goal since April 2015, wildly celebrating a goal far more important individually than collectively. Charlie Austin returned after injury late in a match that petered out, with former Southampton defender Calum Chambers and Rodriguez coming close late on. In keeping with a peculiar afternoon, jeers at the final whistle were followed by applause during Boro's lap of appreciation.